Compound Interest has been referred to as the 8th Wonder of the World. If Einstein actually said that is debatable but what isn’t up for debate is the ridiculous phenomenon of Compound Interest. Sure, we’ve all heard the term Compound Interest but how many of us have truly explored its power? 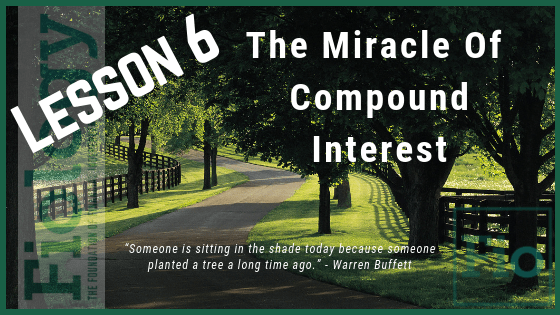 The content in this lesson refreshes our understanding of Compound Interest and brings to the forefront the positive effect it can have in our lives and in the lives of those we care about. As we go through these presentations, focus on the element of time and how even a seemingly small money move made today can result in long-term wealth. Take Action: Use the simple Moneychimp.com Compound Interest Calculator and experiment with the variables based on a very real situation in your life. For example, if we chose to invest $3,000.00 initially for a child and make that same contribution at the beginning of each year at a conservative 8% return for 30 years, our child will have nearly $400,000.00 at the end of that period. Or, if we receive an inheritance of $73,000.00 at the age of 35 and invest immediately, assuming the same conservative 8% return, we would have about $500,000.00 by the time we turned 60 years old. Watch: CFK Podcast 021: The Power of Compound Interest by Dr. Matt Motil of drmattmotil.com. Focus on the math in this podcast. He has a bias towards real estate, which works for many, but the primary value of his presentation is the power of Compound Interest.